Balestier-Thomson Road Heritage Trail (3) – What happened to Towner Road? In my previous post, I showed a 1963 map of a section of Balestier Road. You will notice that opposite Ruby Theatre was a road called Towner Road. In those days, Towner Road led straight to Serangoon Road. But things are quite different today. At first, I thought the change of Towner Road to Whampoa Drive was brought about by the construction of the CTE. But when I consulted my 1981 street directory, I found that by then, Whampoa Drive had already replaced Towner Road in the Ruby Theatre Vicinity, and the CTE had not even been constructed yet. So whatever happened to the missing part of Towner Road? I think only the local boys like YG can throw some light on the matter. Otherwise, I will have to enlist super-sleuth, Icemoon to undertake another assignment for us. This is a photo of Whampoa Drive which was formerly called Towner Road viewed from Balestier Road. Here is another shot taken from Balestier Road. I recall that there used to be a row of shops on the left side of the road. Here is another photo of Whampoa Drive in the direction of Balestier Road. These old shops look like they have been around since the days of Ruby Theatre. Recently many cinemas in Singapore were showing this very famous movie called Painted Skin (画皮). Today, I saw an advertisement in the papers which claimed that it was the number 1 movie in Asia. I am afraid I have not seen this movie. Nowadays, I don’t have the stomach for horror movies. Wait a minute. Actually, that is not true. In fact, I have already seen this movie ages ago; 43 years ago to be precise, and I saw it at a cinema in Balestier Road called Hoover Theatre (豪华). In those days, there were two famous theatres in Balestier Road. Besides Hoover, there was the Ruby Theatre (宝石) just a few hundred metres away. 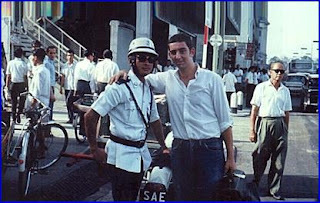 As I mentioned in one of my earliest posts on this blog, in those days, I often came to Hoover with my elder brother David after school. We were both studying in the morning session at nearby ACS in Barker Road. Some years later, another theatre called President was built just beside Hoover. Today, like many other old cinemas in Singapore, all three cinemas have gone the way of the dinosaur. What kinds of movies did we see at Hoover in those days? I remember we saw a lot of Shaw Brothers sword-fighting (wuxia) movies. At that time, the most famous actors were Wang Yu, Yue Hua and Chang Yi who usually played the hero’s roles, whilst the villains were usually played by Lo Lieh and Chen Hung Lieh. I probably missed a few other names. Surprising, whenever I think of Hoover, the other movie, besides Painted Skin, that comes to my mind is a relatively unknown one, which starred Chen Hung Lieh in a rare leading role playing the good guy. I don’t even remember the title of the show but I remember Chen used a very special fighting technique called Hu luo pin yang (虎落平阳). He would descend from the roof tops and attack his opponents with two daggers tied to this ankles. Quite unique actually. Below are two advertisements typically found in the Chinese newspapers (these two are scanned from the book, 40 years of Sin Min Daily). In the one on top, you can see Ruby mentioned in the bottom right corner, and in the next picture you can see Hoover. 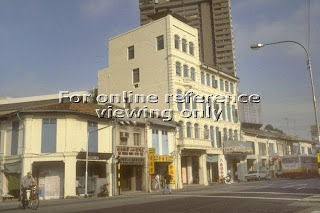 This photo shows a shopping complex (I think it is called Balestier Point) which stands on what used to be the Ruby Theatre which had a open car park in the front. Coming back to Painted Skin, if you want to watch a noisy, scratchy version of the original, you can go to this website. It was produced by Great Wall (长城) and starred two very famous actors of that era; 朱虹 and 高远. For non-Chinese readers, you may be interested to know that Painted Skin is one of over 400 stories in a famous Chinese literary classic called The Strange Tales of Liao Zhai (聊斋志异). These stories have been adapted into countless movies and tv dramas. Liao Zhai is ranked among classics like Journey to the West, which I think even our British friends might be familiar with, (heard of ‘Monkey God’? ), Dream of the Red Chamber, Water Margin, and Romance of the Three Kingdoms etc. as the best known literary works of China. Coincidentally, a few years ago, I saw a Hong Kong tv series on Channel 8 featuring Liao Zhai. In one of the stories, I recognized the much older Chen Hung Lieh playing the role of a father. Read more about the book The Strange Tales of Liao Zhai here. As mentioned earlier, last Saturday, I went to check out the remains of the Jurong Line along AYE (Ayer Rajah Expressway) opposite the Tang Village. Since Icemoon has also visited this place and will be putting up his photos soon, which I am sure are of superior quality to mine, I shall not be showing photos of the Jurong Line. Instead I want to show you some unrelated photos that I took on that day – some pleasant some not so. Let’s begin with the pleasant ones. As I walked on the railway track, I was greeted by these friendly fellas from a nearby construction site …. I think they were kept by the foreign workers living there. At first they were barking as they ran up to me. But I sensed that they were not aggressive and did not panic even as they surrounded me. As you probably sense from my photo on the top of this blog as well as others here; I like dogs. 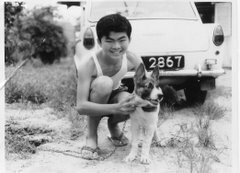 But due to objection from my wife, and the amount of work required to take care of them in today’s urban environment, I have not kept any dogs since I moved out of my kampong in more than 30 years. For example, in the kampong, we could just let them run around and ‘do their business’ anywhere they want, we cannot do that nowadays. Because of the heavy traffic, we also cannot let them roam freely; and have to spend time to walk them regularly. Here’s another photo of me with my nieces’ dogs taken in Ipoh 2 years ago. And now for the unpleasant photos. These were taken just next to the railway track near to the bus stop and pedestrian bridge. This last one was taken just next to the Tang Village’s “Great Wall of China”, along the main road. No prizes for guessing who were the culprits. Maybe we should not be too quick to judge the Serangoon Gardens residents for objecting to the location of a foreign workers’ dormitory in their estate after all. Ours is not exactly the Garden of Eden. In fact there isn’t even any fruit tree left. This beautiful guava tree that I used to see outside my window died recently. Sigh .. and these beauties shan’t be visiting anymore. Nevertheless, the serpent came a visiting. My children kept it in a bottle for a couple of days and then released it in a nearby field. I still do not feel comfortable. They should have brought it to MacRitchie or somewhere far away from houses. I guess the snake was attracted by the many geckos (chit chat in Malay, yim sare in Cantonese) in our house. Lately, we even spotted a mouse. We set up a mouse trap but caught this noisy mynah instead. Later we did manage to catch a mouse, but again my kids were too humane to kill it. In our kampong days, we would drown it by immersing the cage in a pail of water. My children released it instead – where, I didn’t want to know; as long as it is not my neighbour’s house. Recently, my fellow blogger, Ordinary Guy has been reminiscing about the Middle Road area. He made mention of places like the David Elias Building, Selegie Complex and Middle Road Church. However, he has missed out one important landmark which was located at the junction of Middle Road and Prinsep Street. Do you know what place I am referring to? I give you a hint. It was a government department. Today, this place is occupied by a new shopping complex called Sunshine Plaza. The photo below shows the Sunshine Plaza viewed from of Middle Road. But next to it along Prinsep Street, another old building has survived the bull dozers. Can you recognize it? It’s the Elections Department. Just across Middle Road, nearer to the David Elias Building that Ordinary Guy mentioned was a building which used to be a hospital. This was one of two hospitals that carried an unpleasant stigma with it in the old days; so much so that the other hospital, the Woodbridge Hospital in Yio Chu Kang was recently renamed the Institute of Mental Health. The Middle Road Hospital was famous for treating VD or venereal disease. Today, the building which housed the Middle Road Hospital is still standing. 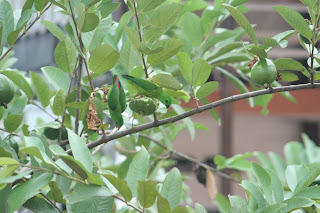 Below are two photos I took of it. The top one was taken around middle of last year and the bottom one just 3 months ago. OK. Enough of digression. Have you figured out the name of that government department I mentioned earlier? The answer is: ROV or Registry of Vehicles. I remember visiting the ROV in December 1980 when I bought my first car, a second-hand Mazda323. Usually buyer and seller would meet at the ROV, do the paper work to transfer the car ownership and hand over the log book and money. My car was only a few months old and had an EM number plate. I think the number was 8641 or 8461. I paid about $17,000 for it. I believe it was one of the first ‘hatch-back’ cars on the roads. It had only a small engine of about 990 cc capacity although the car body was quite big. I remember one occasion when we had a visitor from a (Philips) sister plant in Argentina. This chap was huge .. weighing easily more than 200 lbs. About 5 or 6 of us cramped into my Mazda323 and the car almost could not make it up the Benjamin Sheares Bridge. Talking about Mazda cars, do you recall the Mazda Capella with rotary engine? I am sure Peter would know about this car. My colleague at Philips, Bobby Yee used to own one. It was a very powerful and fast car. Once we drove to Kuala Lumpur and Kuantan in his car. When we stopped at a motor car workshop in Kuatan, some people came around to admire his car and somebody remarked that it was even faster than the Alfa Romeo. This old photo from the collection of the National Archives of Singapore shows a section of Middle Road with many old shops. It looks very familiar but I can't quite identify the exact location. Hope somebody can enlighten me. Thanks. I have a second-hand Yangqin (杨琴) for sale. It belongs to my daughter who used to play for her school’s Chinese Orchestra. If you know of anyone who might be interested, please do let me know. Thanks. Asking price: $600. We paid $1,000 for it a few years ago. For those who do not know what is a Yangqin, it’s called a dulcimer in English. You can read more about this Chinese classical instrument here. Here’s an interesting bit of biblical history where the dulcimer is mentioned. 2. Then Nebuchadnezzar the king sent to gather together the princes, the governors, and the captains, the judges, the treasurers, the counsellers, the sheriffs, and all the rulers of the provinces, to come to the dedication of the image which Nebuchadnezzar the king had set up. 3. Then the princes, the governors, and captains, the judges, the treasurers, the counsellers, the sheriffs, and all the rulers of the provinces, were gathered together unto the dedication of the image that Nebuchadnezzar the king had set up; and they stood before the image that Nebuchadnezzar had set up. Want to know what happened to Daniel’s three friends who refused to bow down to the King's image? Check out Chapter 3 of the Book of Daniel in the Old Testament. Did you see this article in yesterday’s Sunday Times? In a regular column, The Ex-pat Files, Strait Times copy writer Andrew Raven wrote about his encounter with Singlish - Singapore’s unique brand of street English. He narrated his initial surprise and frustrations when trying to communicate with the man in the street; citing examples of a taxi-driver and a property agent. Actually, I think most of us Singaporeans do not have any problem with people poking fun of our English. After all, even our former Prime Minister did that during his National Day Rally speech, and our local comedians do it all the time. But what I find a bit offensive is the attitude of many Westerners who expect Singaporeans to speak ‘proper English’ like them. 1) In the first place, why should a ‘cosmopolitan’ like Andrew Raven be surprised and frustrated at the way we speak? He should know that in every society where English is spoken, there exists a pidgin version. When I visited Seychelles some years ago for a training assignment, I was told by the locals that French visitors were absolutely aghast with the local variety of French (Creole) spoken by the Seychellois. I have not been to the UK, but I suspect that even there, the locals from different part of the country have their own variety of pidgin English which might be unintelligible to visitors. Perhaps my friends John Harper or Brian Mitchell can comment. Once I saw news clip on TV where a Caucasian derided the way Singaporeans spoke. I think he was an American. He was at a meeting with some Singaporeans; and “almost fell off his chair” when one Singaporean rose to leave and said; “I have to make a move first.” In the U.S. it seems, when somebody wants to make a move, he is either going to draw his gun or throw a punch. 3) Actually, if we want to be picky like him, we too can find many incidences of ludicrous use of the English language by Americans. Take for example the words ‘hot’ and ‘cool’. I have heard both adjectives being used in the same sentence to describe a handphone! And just the other day, I overheard an interesting exchange at a neighbourhood clinic. An American lady approached the receptionist just after consulting the doctor and asked; “What is the damage?” You can imagine how unintelligible that would be if the receptionist had not been exposed to Hollywood TV shows and movies. I think one can think of lots of strange expressions and words introduced by Westerners, especially Americans that sound even weirder than our Singlish. The only reason they are still comprehensible is because of the widespread influence of Hollywood and pop culture. In conclusion, I have this bit of advice for expatriates. If you want to come to work and live in Singapore, you should adapt to our ways and not expect us to adapt to yours; even if you will begin to sound a bit silly to your own countrymen before too long. 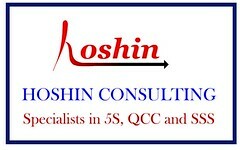 I remember an interesting anecdote my former colleague from Hong Kong shared with me. Within six months of living in Singapore, he found himself unintentionally introducing local words like ‘pasar’ into his Cantonese which completely baffled his relatives in Hong Kong. 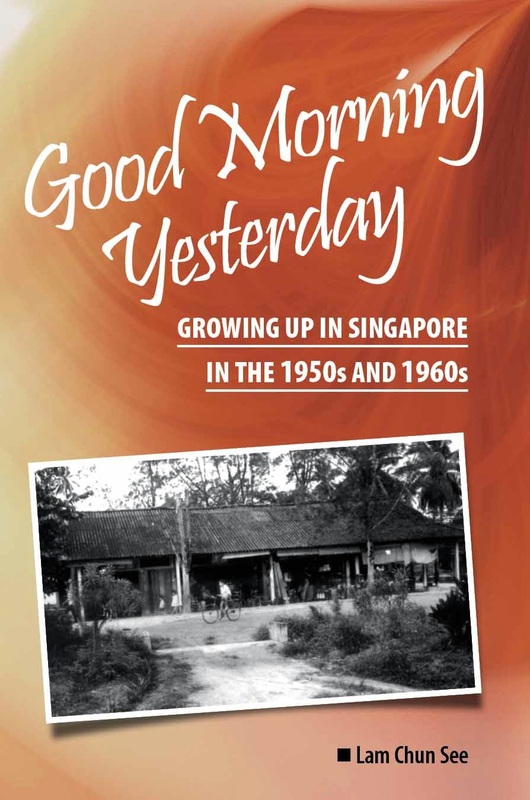 In 1961 I made my first trip to the CBD (Central Business District) Area when I accompanied my father to the Singapore and Malaya Stock Exchange at the Singapore Rubber House. My father felt it was a good way for me to brush up my Arithmetic; currency conversions from Pounds, Shillings & Pence to Straits Dollar, Fractions and Mixed Numbers. Anyway this article is not about the stock market but on Change Alley. After I got most of my Arithmetic correct, I was allowed to independently wander into Change Alley for up to 2 hours. This was how I learnt everything about the place. Change Alley was not as boring as the other buildings on Collyer Quay. Most of the major legal firms, shipping firms, trading houses, office products, compradors and banks were at HK Bank Chambers, Union Building, Winchester House and Ocean Building. There was even SHELL House, the head-office of the SHELL group of companies in Singapore. Change Alley was different because it was filled with bustling retail activities. People squeezed their way through a narrow lane with shops on both sides. Make-shift tarpaulin covers protected shops and shoppers from the sun and rain. There were shops dealing in imitation Rolex and Omega watches, clothing (T-shirts, Arrow Shirts and Batik shirts), leather (belts and shoes in leather or crocodile finish), ladies hair accessories (brushes, combs, hair-band, clips) and Chinese curios (jade pendants). One retail shop which began in Change Alley was Boon Radio or Boon & Company which dealt in cameras. There was one “Tau Fa Shui” stall on tricycle at the Raffles Place end of Change Alley but there were many cobblers, locksmiths (ala “Mr. 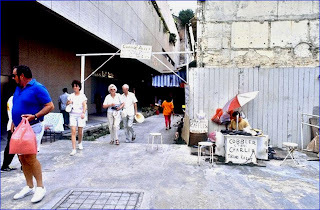 Minute”) and fresh fruit sellers at both ends of Change Alley. Don’t forget there were many pick-pockets operating in Change Alley. The shopping strategy was to bargain and walk away if you were not happy with the price. Don’t be surprised; “Johnny” was pretty good at bargaining. The shop-keeper trailed Johnny for some distance and to close the deal would animatedly ask; “OK you tell me how much you want. I make very good price for Johnny. I don’t earn. No problem. You my friend OK”. Next moment after further haggling, Johnny gets his goods and the shop-keeper smiles. You just have to wonder who gained but realized it’s all about brinkmanship. A unique voice which added much character to Change Alley was the money-changer, typically Indian Muslims. You knew they had to be one because they wore checked-printed sarongs held by a broad black leather belt, long sleeved white office shirts tucked over the sarong and black songkot. Each time a European tourist or a British sailor in his white splendid uniform walked past they would loudly shout; “Money (2)............ Money Change (2).......British Pound, American Dollar, Singapore Dollar.” My favorite past-time was to watch the Money-changers counting notes. In fact my Indian friends claim I can imitate one. The money-changer first wets one of his thumbs with saliva before counting the notes. Then he spreads the notes with 2 hands like a fan. To every question raised, he shook his head as if indicating an affirmative answer. Unless you had something to buy, locals would never go to Change Alley because the prices were priced to suit the European pockets. Change Alley was strategically located because it had a bus stop in front of SHELL House. This brought many Europeans to Change Alley. For that short-cut from Clifford Pier to Raffles Place, locals walked through The Arcade Building, a Moorish-looking building on the outside and on the inside. The Arcade Building offered a different level of comfort and shopping experience from Change Alley. Change Alley was demolished in the early 1990s and with it ended one of the colourful chapters of shopping and bargaining in the CBD. For me I last saw Change Alley in 1980. The above maps are scanned from the 1963 street directory courtesy of Peter Chan. I must confess that some of these are quite new to me. For example, I have never heard of Pulo Saigon Circus, Shenton Circus or Anson Circus until now. Below is my answer to the Straits Times reporter’s question about whether or not roundabouts should be preserved? From the point of view of history/heritage, I feel that we should try to preserve some roundabouts. However, this may not be practical from the traffic engineering point of view because I don't think roundabouts are suitable for handling the high volume traffic that we have on most Singapore roads nowadays. I guess that is the reason why our traffic authority has converted most of the roundabouts to traffic lights controlled junctions. I believe the authorities know what they are doing. For example, even in Newton Circus, they had to install traffic lights to regulate the flow. However, having said that, I think some places can technically be converted back to roundabouts because of the change in infrastructure. Take for example, Holland Circus. This was converted into a traffic light junction because of the increased volume of traffic. However, with the addition of a flyover and an underpass, the number of vehicles making a right turn has reduced significantly. Hence, a roundabout would be more efficient than the present traffic lights. In fact, I can think of one place where this is the situation. This is the PIE/AYE junction in Tuas. However, I suppose it would be too costly to revert back to a roundabout and hence we have to live with it. After all, the number of vehicles affected is relatively low. I guess this applies to other places like Clementi Avenue 6 - Commonwealth Avenue West junction. As a road user, I don't think we should preserve roundabouts simply for the sake of nostalgia or heritage. We must be pragmatic about such things. In fact, I think many young drivers do not even know how to drive correctly in a roundabout and in a busy junction, it might even lead to accidents. But in places where roundabouts can do a better job why not? Good example is Newton Circus where many roads converge at one point.